As described on the Cynwall page, the main point of my Elven army was a quick-paint-to-play army to have something to play with while painting the Orcs of the Behemoth army containing miniatures that take considerably longer to paint. Nevertheless I am not entirely happy with how these Echahïm turned out and I think it is because I feel they lack definition between the light blue armour and the white cloth. 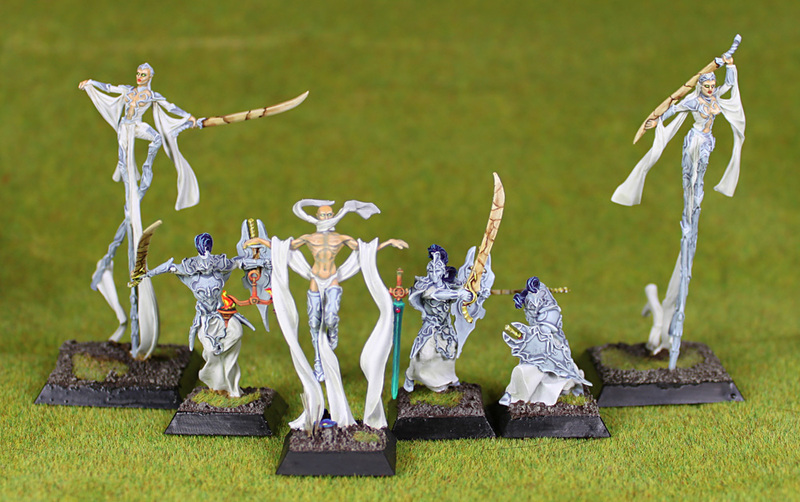 I also think their face look more like drag queens than elegant elven females, but as this is a paint-to-play army, I am not going to repaint them.. I think. In any case, they do work when next to the rest of the army. And they do work when facing the enemy.